The buff pair are kidskin whip stitched with waxed silk using a Glover's needle. 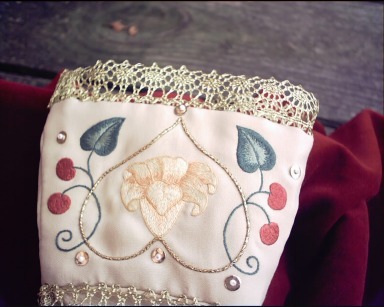 The cuff is silk embroidery on silk, backed with linen, lined in silk & whip stitched to the glove. 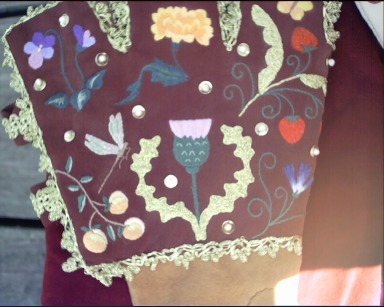 Long-and-short stitches with straight stitch shading predominately on the flowers & leaves with stem stitch outlines. The gold cording is couched with silk, spangles are self made from gold-filled sheet metal attached with fresh water pearls & waxed silk. The bobbin lace is modern retail. The cinnamon glove is thin suede stitched with waxed silk using a running stitch. 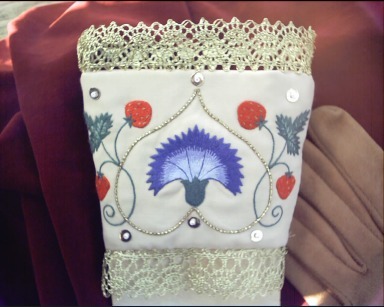 The cuff is embroidered with silk on silk, backed with linen, lined in silk & whip stitched to the glove. DMC gold floss & silk was used for couching. The stitches include split, stem, long-and-short, satin, straight & an occaisional French knot. The spangles are attached with glass seed beads & waxed silk. The lace is modern retail.